Apple has announced updates to its ageing iPad Air and iPad Mini models, last updated in 2014 and 2015, respectively. The two new iPads have been teased by Apple ahead of its full launch event on 25th March, where an Apple-branded Netflix competitor is also hotly anticipated. 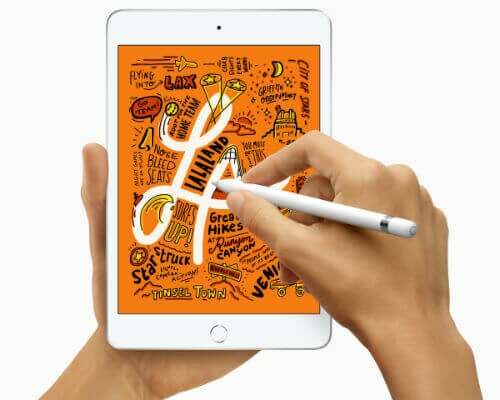 The standout features of the new iPads is that both models now offer support for Apple Pencil, and both feature the latest A12 Bionic processors. However, there’s no major design overhauls for either device. Unlike the latest iPad Pros, both still use the Home Button and lightning cables. These new iPads aren’t cheap, either, with the Mini starting at $399 and the Air starting at $499. So, should you buy these new iPads? We had presumed that the iPad Mini wasn’t long for this world. With ever-larger iPhones, it seemed the singularity between the two devices would be coming sooner rather than later. However, the new iPad Mini looks set to be a perfectly acceptable tablet — particularly for well-heeled students and kids. Apple Pencil support should make the new iPad Mini perfect for sketching, or scribbling notes in class. It also supports side-by-side multitasking, so you can have two apps open at the same time, which should be a boon for productivity. The new iPad mini has a slender 6.1 mm deep frame (1.6 mm thinner than the iPhone XS). This should make it ideal for throwing it in a messenger bag, or even a larger jacket pocket, before heading out for the day. The new A12 Bionic processor, which impressed us immensely on the iPhone XS Max, means that the iPad Mini should have plenty of power for play as well as work. Demanding mobile games and AR apps should be a breeze, while its headphone jack(!) means you’ll be able to use any headphones you want. Should you buy it? If you’re looking to grab a bargain tablet for your kid, or for lazing on the couch with, this isn’t a cheap choice. However, if you want a tablet with top-level speeds and a great screen, the new iPad Mini probably as good as it gets. Apple is pitching the new iPad Air as a powerful tablet with professional-grade features, but without the professional price tag. And, on the surface at least, it looks like Apple might be onto something. 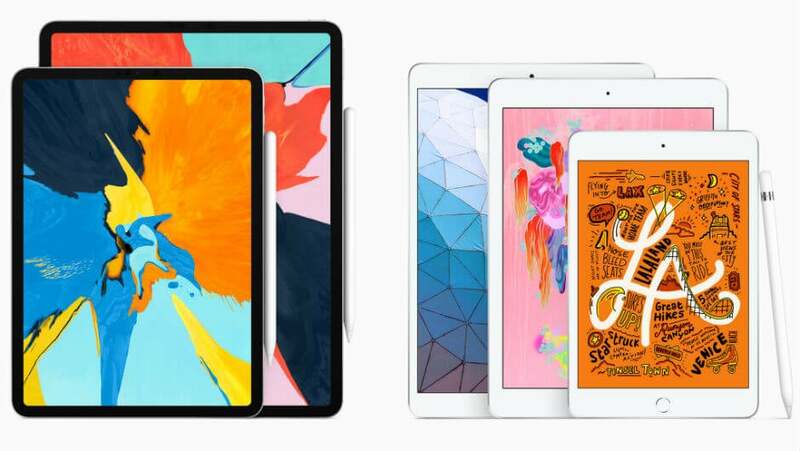 The 2019 Apple iPad Air has a 10.5-inch screen (0.5-inches smaller than the smallest iPad Pro, and bigger than the run-of-the-mill 9.7-inch iPad). 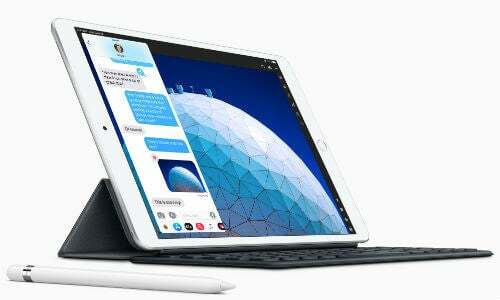 It features support for Apple Pencil and the Smart Keyboard. It starts at $499, which isn’t cheap for a tablet. But, it’s a whole $300 less than the cheapest iPad Pro. It uses the same A12 Bionic processor as the 2019 iPad Mini and latest iPhones, so it should be plenty powerful for all but the most intensive desktop-grade professional apps (think CAD design and rendering tools). Throw in the Apple Pencil and Smart Keyboard and you’re looking at a pretty viable laptop replacement for $757. It’s not all good news, though. The new iPad Air still uses the lightning port, meaning connecting to other devices isn’t as painless as it is with the new iPad Pros. Plus, its 2224×1668 resolution display isn’t exactly class-leading — especially when Sony is chucking out 4K OLED phones. Should you buy it? If you’re weighing up a MacBook or iPad Pro, then the cheaper iPad Air – when combined with the Pencil and Keyboard – is a surprisingly viable alternative. As long as you’re not writing for extended periods of time or using super-powerful apps, the iPad Air might be a great way to save some cash. Both the models are expected to ship in 5-7 business days from now, and can be purchased from Apple.com.